We at AREC are committed to providing you with a detailed training program complete with on course aid stations as necessary and occasional guest speakers, in addition to experienced leadership and advice, motivation, mental preparation and all of the tools necessary to accomplish this courageous goal. And we will have a great time doing it! Our “Official” training program is geared to coincide with the LA Marathon events on March 24, 2019. Training runs take place on Saturday mornings at 7:00 am and start/finish at the Joe’s Crab Shack parking lot (6550 N. Marina Dr.). Please arrive early each week to sign in, warm up, stretch, use the restroom and mingle first. Distances begin shorter and get progressively longer. In the weeks (and months) leading up to the training, it is recommended to slowly build up your weekly base mileage in preparation. Our Wednesday runs are a perfect opportunity to help build this base. The training is included with annual club membership, so sign up today. The Long Beach, Surf City and Orange County marathons all provide incentives to running clubs that help maintain your low annual membership dues. So when you sign up for these and other events, you can thank them for their support of the running community by designating AREC as your running club! 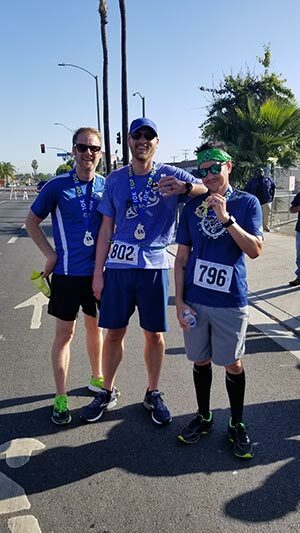 The Surf City Marathon in February and the Orange County Marathon in May.All members are welcome to join the LA Marathon group to train for the half marathon distance or full at Surf City or OC Marathon. We have a facebook group set up to post weekly runs and updates in.